The city of Philadelphia is suing the Trump administration over its crackdown on sanctuary cities. Mayor Jim Kenney argues that the Department of Justice has over-stepped its authority after announcing that they will be adding conditions to law enforcement funding. In an attempt to maintain trust between law enforcement officials and immigrant communities, the City of Philadelphia filed a lawsuit in federal court Wednesday morning against U.S. Attorney General Jeff Sessions, who recently imposed new restrictions on federal grant money for so-called "sanctuary cities." Similar lawsuits against the attorney general have already been filed in five municipalities, including Chicago, San Francisco and Los Angeles. The city hopes to prevent Sessions from imposing new and “unprecedented” requirements on the Edward Byrne Memorial Justice Assistance Grant (or JAG grant), which provided Philadelphia with $1.6 million last year to spend on police overtime, training, equipment, courtroom technology and other aspects of the criminal justice system. The lawsuit refers to Philadelphia's "vibrant immigrant community" as a vital part of its workforce and says the city has adopted policies "that seek to foster trust between the immigration population and city officials and employees." As a rule, Philadelphia officers do not ask residents about their immigration status. Sessions, at the behest of the Trump administration, announced new conditions in late July for any city or state receiving JAG money. They required municipalities to provide ICE with 48-hour notice of any scheduled release of so-called prisoners of interest and allow immigrations officials to interview inmates while in custody. The lawsuit contends that while JAG money goes through the U.S. Attorney General’s Office, the grant was established by Congress to help local law enforcement fight crime. It cannot be changed or amended without authorization from Congress to expand immigration enforcement. The Department of Justice called the lawsuit "a disservice" by "protecting criminal aliens rather than law-abiding citizens." 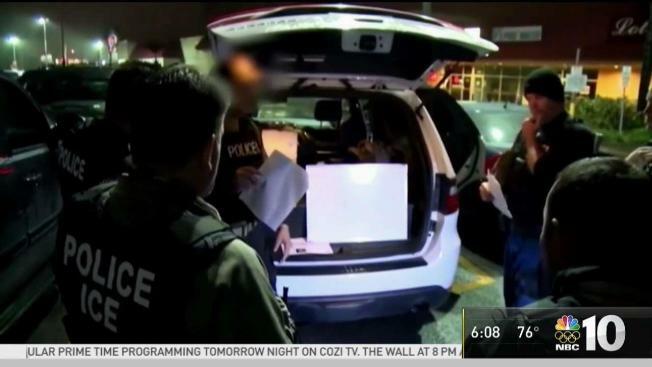 "When criminal aliens are returned to the streets instead of sent home, public safety is undermined," said Department of Justice spokesman Devin M. O'Malley. But immigration advocates argue that asking police to perform ICE duties would only undermine an already fragile trust built between law enforcement officials and immigrant communities. A May 2017 report conducted by FiveThirtyEight found that immigrants in three cities, including Denver and Philadelphia, reported fewer crimes committed against them after the election of President Donald Trump. While this could signal crime is down overall, it could also suggest immigrants are scared of being profiled or deported, according to advocates. "We want to send the message that Philadelphia is a safe place," Miriam Enriquez, executive director of Philadelphia's Office of Immigrant Affairs, said. "We don't want people to be afraid to speak out." On Wednesday, Kenney also signaled a willingness to help undocumented immigrants, especially children, impacted by Tropical Storm Harvey. Philadelphia offered assistance to people displaced by Hurricane Katrina in 2009 and could do so again. Meanwhile, Councilwoman Helen Gym issued a statement expressing her support for the lawsuit. "I am proud to stand with Mayor Kenney and the City of Philadelphia as we take on the outrageous actions of this federal administration," she said. Kenney has at least one ally in Philadelphia Councilwoman Helen Gym, who issued a statement expressing her support for the lawsuit.